An ancient Devon Church the oldest parts date from the 12th century, but there has probably been a place of worship here since Saxon times. The church is dedicated to St. Mary the Virgin. In the church you will find a Leaflet about the church and its history. Click here to download a copy. There has almost certainly been a Church on this site since Saxon times that was most likely built of oak timber. The church as we see it today consists of chancel, nave, north and south aisles, south porch, western tower and a western vestry. The tower dates from about 1250 and the rest of the church including the screens and ceilure (decorated ceiling over the rood screen) to about 1450 when the church, with the exception of the tower, was entirely rebuilt. The font is a fine large bowl of local stone supported by five shafts, a thick central one, and a smaller at each corner, it dates from c.a. 1170 and likely belonged to an earlier church on the same site. The GRANITE PIERS are monoliths. The ROOD SCREEN was partially restored by Herbert Read Ltd of Exeter in 1956. The rood (crucifix) and figures of our Lady and St John were restored to the screen at this time. The paintings on the panels of the rood screen(see below) are original and were restored by Miss Anna Hulbert 1977 to 83 with the help of grants from the Council of Care for Churches. The CEILURE is one of the finest in the country. It was completely dismantled and restored by Herbert Read & Co. in 1975. The stained glass window in the north aisle depicting angels is fifteenth century. The stained glass window in the south aisle chapel is nineteenth century. A coloured plaque on the west wall commemorates the silver jubilee of Her Majesty Queen Elizabeth II. The parish registers are of the earliest date. The birth of Edward VI. Is thus mentioned in it: — "The eleventh day of October, the year of our Lord God 1537, was borne Prince Edwarde, which was the 29th yeare of our Sovereigne Lord, King Henry VIII., by the grace of God King of England, France, and Ireland. God send him good olde age, and his father a long and prosperous reigne, Amen. Thomas Herle, vicar of Hennock." The earliest recorded date for Baptisms is 1541, marriages 1541 (with a gap between 1623 and 1652) and burials 1541. Work is in progress to provide a list of ancient burials and where possible the location of the burial in the Church Yard. The staircase to the former rood loft has gone, but the blocked up doorways below and above can be seen in the south aisle. In the upper doorway there stands the figure of a little angel with a trumpet, this figure was probably previously on the canopy of a restoration pulpit (17th Century). The Church Tower contains four bells hung for swing chiming. In 1552 during the reign of Edward VI is found in the inventory of Church property that the Tower contains four bells, however of these four only two originals remain. The other two have been recast, one of them twice. The treble bell is the oldest bell in the tower; it bears the trademark of ‘Robert Norton of Exeter’ who lived between 1400 and 1450, this trademark is a circle of cable-pattern containing a bell flanked by the initials R.N in black letter script. The cross is a pretty one, decorated with fleur-de-lys, and the inscription is in handsome decorated capitals. It is the first part of the alphabet: - + a b c d e f g h i j k.
The second bell was recast in 1904 from a bell that was itself recast c.a. 1637 by Thomas Pennington of Exeter at the same time as the Tenor bell was recast. The recast bell of 1637 bore the inscription ‘SOLI DEO DETUR GLORIA’. ‘MEARS & STAINBANK FOUNDERS LONDON’ and on the waist ‘FEAR GOD, HONOUR THE KING. The cross is larger than that on the treble, and was a favourite one with the later Exeter founders. It is a good bell from about the end of the 15th Century. The Tenor bell was, along with the second bell recast in Exeter in 1637 by Thomas Pennington, whose initials appear on it. The inscription is: RICHARD BALL THOMAS PINSEN CHURCHWARDENS T P 1637. The diameter is 38” and it weighs nearly 10cwt. The Pennington family were casting bells in Exeter from 1630 to 1741, and another branch continued business in Cornwall until the early 19th Century. In 2011 the Bellframe was repaired which means that we can now ring the bells again for the first time in over twenty years. Most of the work was done by volunteer labour from the village using oak from two trees that had fallen down on local farms. This was a real achievement and we are very grateful to all concerned. We now have a group of amateur bell ringers, none of whom had rung before, if you would like to join us please ring Brian on 01626 833229 or turn up at the Church on a Thursday evening at 6.30, we are usually there and would like to meet you. The Bell Frame. A part of the bell frame is ancient, probably about 1500. It rests on four 11” beams, which rest on offsets in the tower walls, and are probably original. The bell-cage appears to have been rebuilt and strengthened at the time of the recasting of the 2nd and tenor bells, but some of the old timber was reused, as is shown by mortises which serve no purpose in the present arrangement. One of the old frame heads was re-used as a cross-beam at the top of the cage; the recess for a bearing and the clearance grooves for the lip of the bell can be clearly seen. The wall of the tower was cut away for an almost complete circle, to a depth of about 4” to give the treble bell room to swing, this probably took place when the frame was rebuilt. The timber is oak throughout and is massive, the main parts of the trusses being 10” or 8” by 4” and seems to have been hewn out with an adze. This account of the bells was given by Rev J.G.M. Scott. In the late 20th century the Bell frame fell into disrepair and it became too dangerous to ring the bells. In 2011 the Bell frame was repaired and the Ellacombe chiming apparatus removed, so the bells can be rung again for the first time in over twenty years. Most of the work was done by volunteer labour from the village using oak from two trees that had fallen down on local farms. This was a real achievement and we are very grateful to all concerned. Repairing the Bell frame © A Jacobs.. The Church Organ. Was an Apollo Organ built by Rushworth and Dreaper and installed in 1954. The organ was sold in 2009. 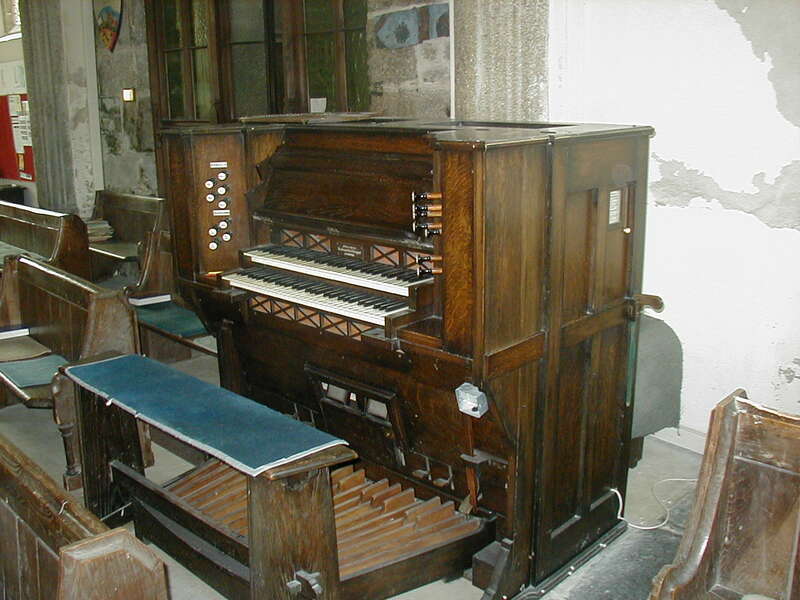 The Church Organ in it's original location. Photo reproduced by kind permission of Robert Allan. The Paintings on the Rood Screen. North Aisle North (1) St. John the Evangelist (book and chalice) Brian, I propose a picture here of each panel which I will take when we can move the pulpit.